Media: watercolour paper, collage, watercolour, gold leaf, gold dust, graphite, Kyoto ink, Indian ink, vintage Pitt Rivers Museum display box with glass front. About: This shrine contains an imprint of my left hand palm down. From this I created a Middle Eastern Khamsa (meaning 5) with a central 3rd eye. Behind my hand you can see 7 smaller golden images of left hands and a sacred doorway leading to the unknown. 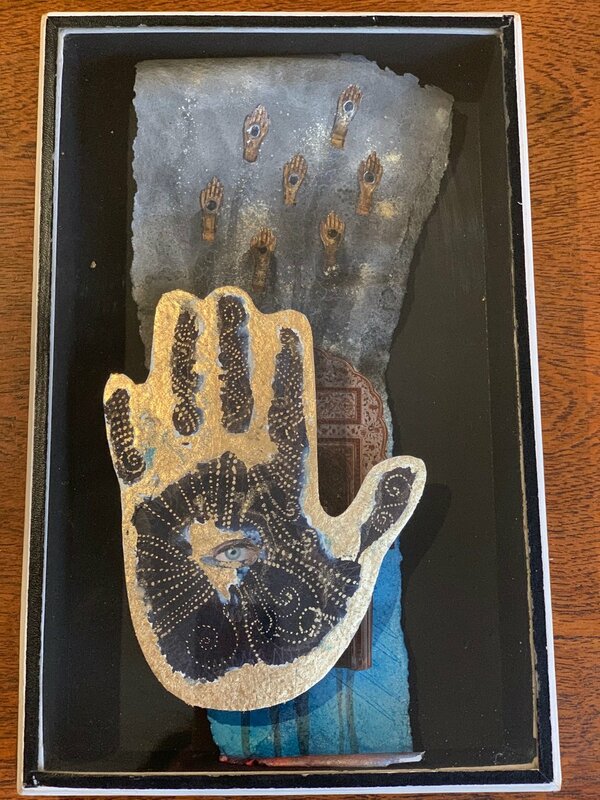 The indexical imprint of my hand is a direct connection between this shrine and my body. It is therefore a kind of relic of my body. What have I enshrined? My sacred left hand. My life. 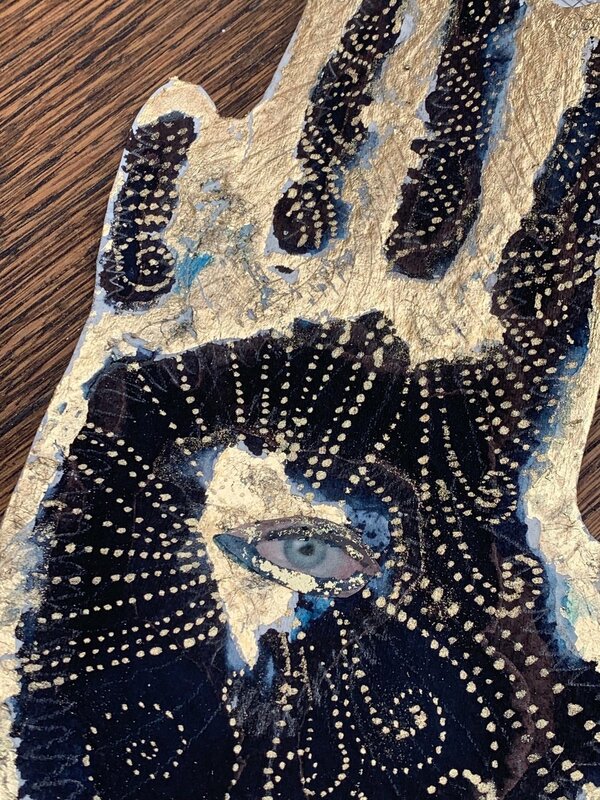 It is the hand with which I create art, and it is connected to the right side of my brain that creates embodied understanding of the world, wholeness, empathy and mystery. My left hand is also on my actual physical left side so it is connected to my weakness and my illness. It is both my strength and my failing. I enshrine my weakness as my strength. I have also enshrined, protected and adorned my sacred beliefs. My belief in the ability of the body, through the 3rd eye of intuition and instinct, to reach beyond the palpable world of reality. Like the pineal gland, the 3rd eye can sense darkness and light. Perhaps it is the seat of my premonitions. I sense the coming of darkness sometimes and other times the light. I saw my illness months before it arrived. My belief that touching is seeing. The eye cannot see without touch. The 3rd eye is also the eye of the hybrid person from two cultures who sees both sides, sees from within and without. I am from the East and from the West. I see both sides. I am not either/or but both/and. My belief in the power of ornament to shimmer and ensnare the body and its sensations, to engage the body in its haptic tactile embrace, and lead the body to deeper understanding. Ornament also entraps the evil gaze so that it becomes lost and confused, wandering the corridors of beauty. Ornament adores, adorns, uplifts and enshrines. 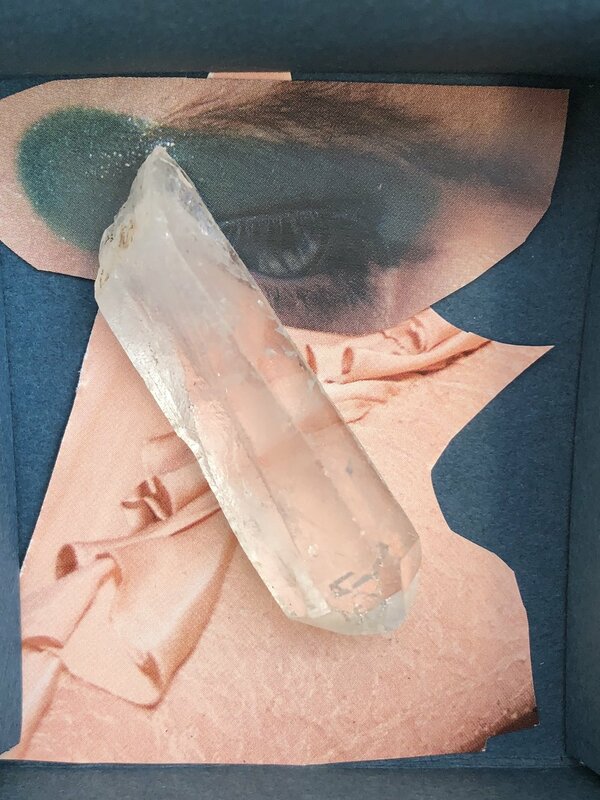 I have enshrined my duality – Eastern and Western, left and right, darkness and light, spiritual and physical, strength and weakness, science and magic. Where duality is not opposition but harmony. In many cultures the left hand is sinister, dangerous, sly and weak. Maybe my left hand is all these things because it is the gateway to what is not understood. In my Islamic upbringing and at my Catholic school, the left hand was seen as connecting to the dirty and the devilish. They all tried to correct my weakness. So I enshrine, the dirty and the devilish too. And my weakness. 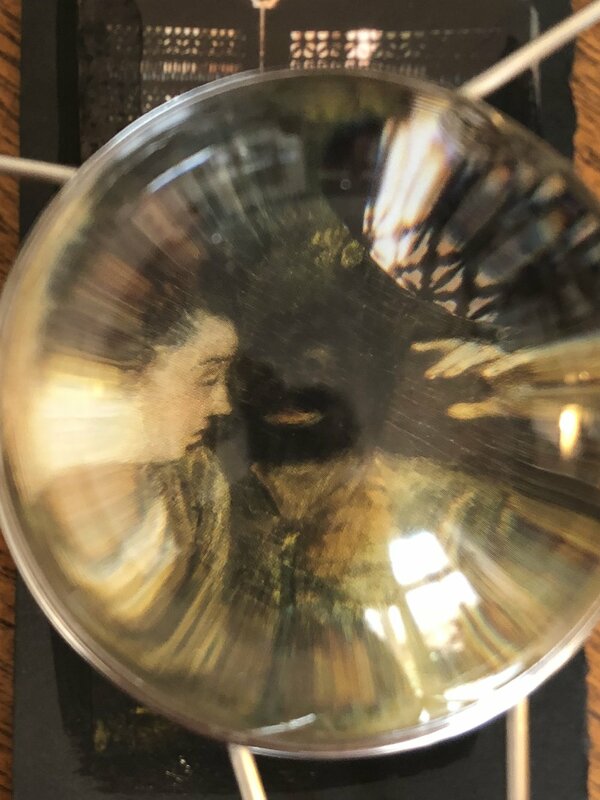 I will be exhibiting works/installations that interweave and connect with each other on themes of body, memory and the passing of time and evoke the memory of body through sound and touch. I wanted to make use of the unusual and fascinating gallery space at OpenHand OpenSpace – its strangeness, and how it is like an old shell, with scars and marks that recall it’s own past, and how there is a certain quality to voice and sound within it’s walls. A key structural metaphor for me in this new work on memory, aging and passing of time is the shell or casings, but also other residues and deposits like bones and minerals. White ‘remains’ of ‘histories’. It seems to me that memory is like a secretion, an exudate that we accumulate, that builds layers slowly over time to create chambers around us. The world passes through us, and emerges as altered residues that create a shell around us that replaces reality. What becomes fossilised or crystallised, and what is lost in this process? The shell that the body has secreted around itself, or inside itself, retains within its physical structure the traces, marks, patterns and formations relating to its past. This secondary body of memory and recollected sensations is created in the space between body and mind. Between reality and imagination. It is a constant framework through which we see and feel that grows in strength as we age. Memories are deeply seated in the body. We remember sensations. Our body remembers. The shell and the pearl or nacre secreted by it is encumbered with notions about the female body. The secretions of the female body are often taboo. This work is very much about what a woman’s body remembers. 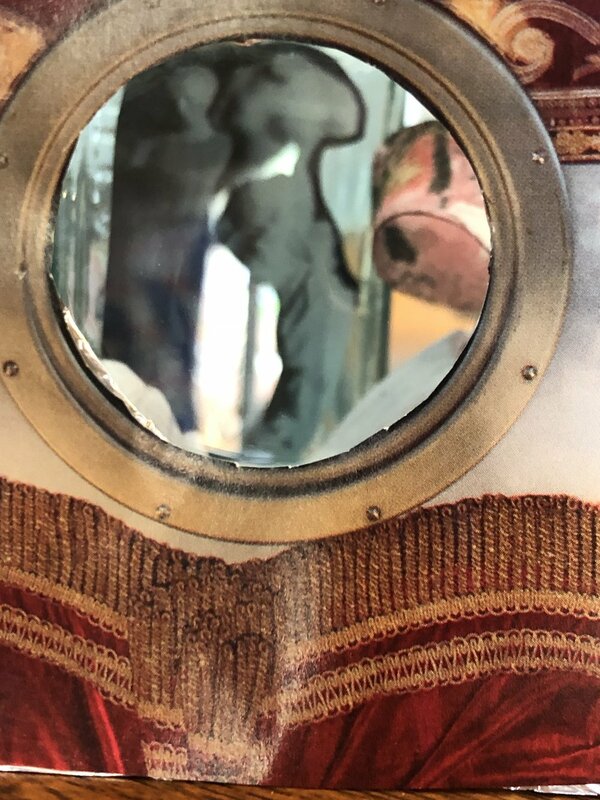 I have created a series of ‘viewings’ using various means to create the distortions, alterations, fragments and glimpses that characterise memory. We are always kept at a distance by memory. Touch, smell, sound, image, as if behind a glass. 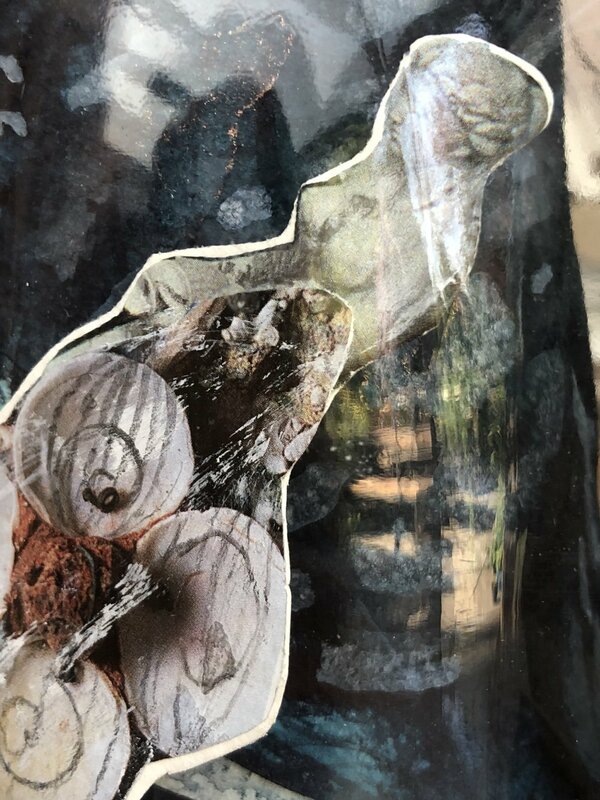 When I created this installation I asked myself: What is the relationship between the private, personal memory and social, political, cultural, historical memory? What meta-forces shape us, carve us out, create our desires, and experiences, and alter our senses? We are not free to only remember our own ‘truths’. What truth is there to our memories? I don’t have the luxury of forgetting the colonial past that hugely affected my father’s life, and which brought my father and mother together. These cross-generational and cross-cultural memories became mine. Forgotten histories must be remembered. 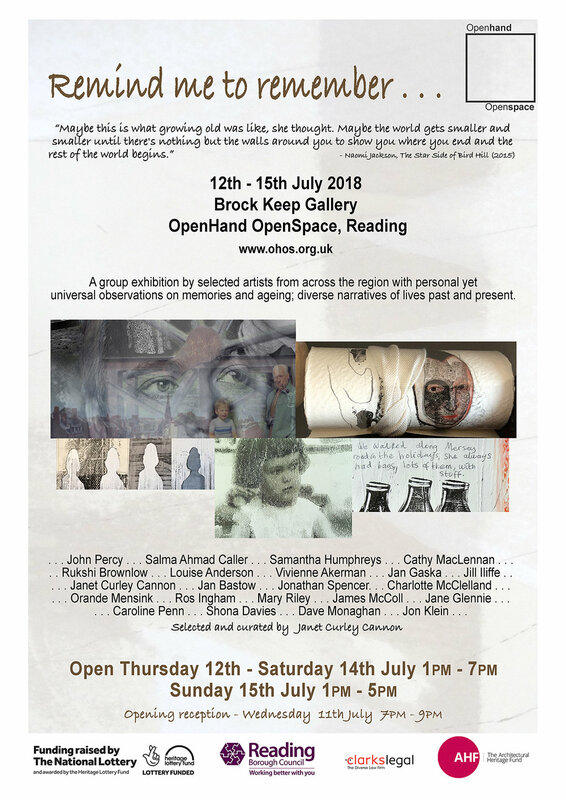 I will be exploring a notion of memory as residing within the body and a notion of memory being like a sediment or fossil that builds up over a life time, like the layers of material that create bone, chalk or shell. This ‘shell’ of memory then creates the space in which we live out our later years and is an idea of memory as physical, an accretion of sensations of the body over decades. The memory-body or shell has been shaped by traumas, pains, joys, people and environments, substances and materials we have touched and that touched us. But crucially it has also been formed and deformed by society/culture and what is ‘expected’ of the female body. There is an understanding that as we grow older we remember the past more than we think about the future. So the ‘memory body’ takes over our ‘real body’, and we live in its corridors and spaces with echoes of the sounds and touch of our past, but also with the sounds of our younger bodies and how they were ‘admired’ and ‘required’ to have certain attributes. The organs of the body assert themselves over the mind. It is well known that pain and trauma are often buried by the body/consciousness. The body decides what we recall. It hides or fades out some memories, and others it suddenly produces after decades of forgetting. We have sayings like ‘time heals all wounds’. Yet somewhere in each organ are traces of all experience. Memory as pattern, carved out shapes, and etched marks and residues of sensations we felt and things we did. I imagine that each organ has been stitched, carved, ornamented, with these passing sensations, a gut feeling, our altered breath, touch on our skin making our heart beat. Getting ready for Reading Contemporary Art Fair Saturday 21st and Sunday 22nd April 2018. Welcome to my page for Reading Contemporary Art Fair 2018. I will shortly be uploading a video about my first artist book What it is like to have a Woman's Body. This work is about the quirky painful eccentric and bizarre world of having a woman's body. It is a visual exploration of my own subjective embodied experience. I am interested how social and cultural expectations shape and mould our bodies and body image. My practice is about embodiment and the senses. How does the world of touching and feeling carve out body imagery? What is the body in the mind? This is my first art fair in quite a while, having had some time off to fight a critical illness. But I have been making work again for some months now and am excited to have this opportunity to share it. 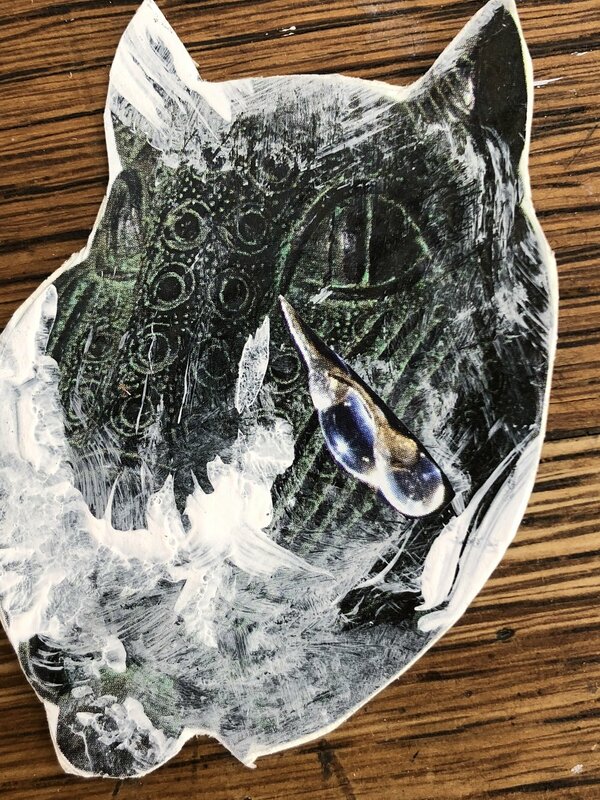 I will be posting images of new works and progress regularly on Instagram @salmacaller so please come and say hello and see what I am creating for Reading Contemporary. Materials – Collage, watercolour, Indian Ink, graphite, gold pigment dust, acid free 300gsm rough watercolour paper and recycled vintage museum boxes. May also contain found objects: poppy seed head, clay pipe, wood, and other materials. *About the Curiosity Boxes: The woman’s body was once regarded as a curiosity, a strange ‘other’ in relation to the male body and to some extent still is. Both she and her parts have been and sometimes still are variously treated as bizarre, as potent and dangerous, as monstrous, unclean or repellent, or as ornamental and vacuous. I will also be regularly updating this page with sneak peaks of new pieces so do come again ! 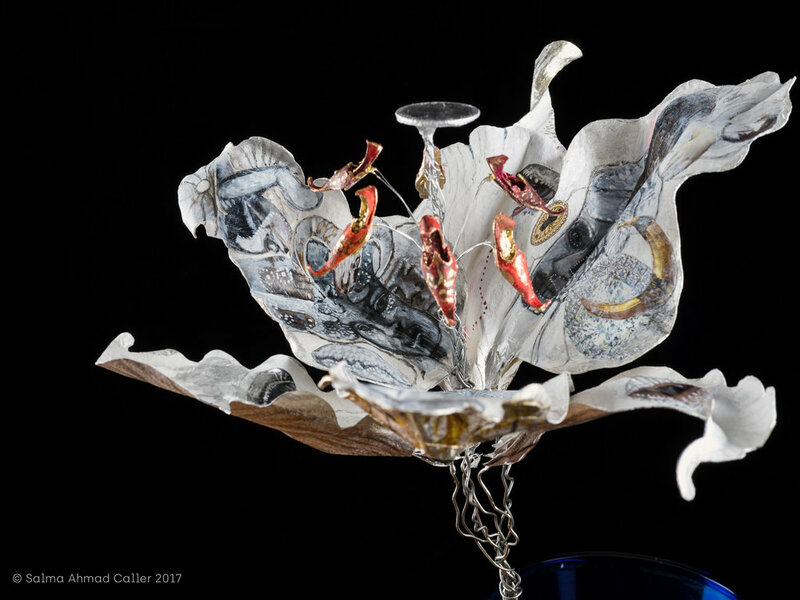 "A cultured Mahomedan" : Two flowers for Oscar Wilde have been dedicated to cultural diversity, tolerance and Black History Month by artist Salma Ahmad Caller. 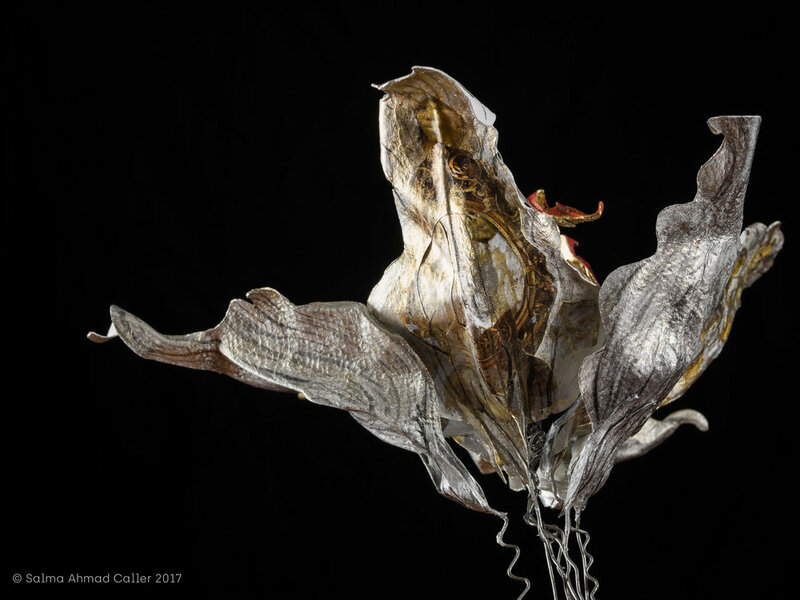 Lilies for Oscar Wilde is a fascinating idea for a collaborative art installation in tribute to Oscar Wilde that will be unveiled at Reading Museum, located in Reading town centre not far from the historic Reading Gaol where Oscar Wilde was incarcerated. This collaboration will bring together the works of over 60 artists and makers who live and work in Reading and will run from October 2017 (Black History Month), until January 2018. Artist Salma Ahmad Caller has taken a unique and timely cross-cultural approach towards her tribute with two works that call attention to startling and often overlooked views in Oscar Wilde’s writings. Title of works: Salome: A Tragedy in One Act of Looking: Lily-1 Dreaming in Black and White, and Lily-2 A Cultured Mahomedan. Materials: 300gsm acid free watercolour paper, collage, Indian Ink, acrylic, gesso, watercolour, gold and silver pigment, acrylic mirror, wire. 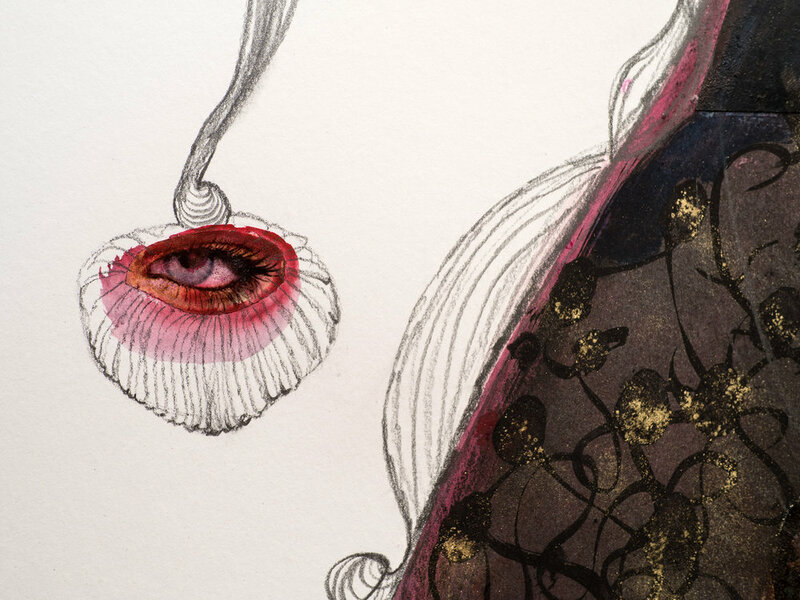 Myriad of the Hollows, and Velvet Silk Purse - from The Bodies of Dolls: Patterns of Sensation series. You can read the full text about these new works below. 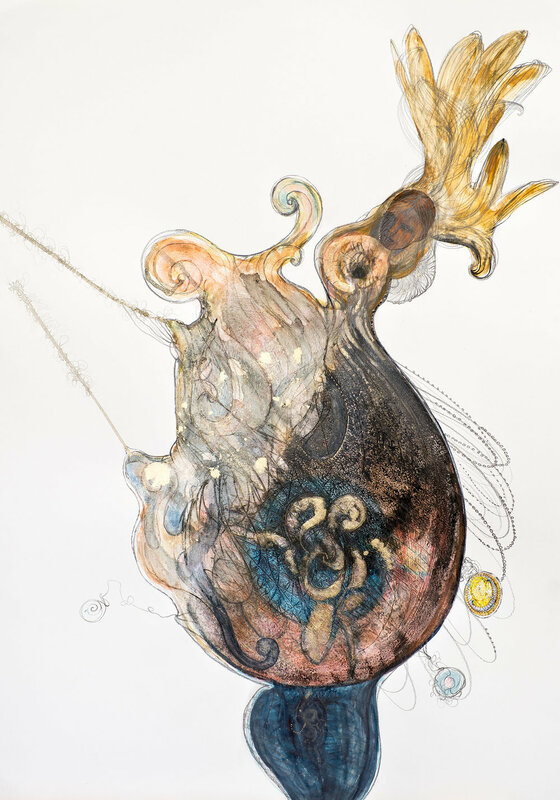 This series of works on paper by artist Salma Ahmad Caller, explores the notion of the female body as an idea that is constructed, made like a folk doll’s body, from materials both real and imagined. The folk doll or fashion model is patterned and marked by how a society thinks about femininity. Each material used to make ‘her’ carries it’s own set of cultural notions, sensations and associations.‘She’ is often ornamented with patterned textiles, jewels, silk, velvet, embroidery, pearls, shells, tassels, bells, or associated with flowers, fruits and fertility, or with lace, nets, knots and webs, creating textures that carve ‘her’ body into zones of social and sexual importance. Forces of cultural and social expectations mark and carve our bodies but also the things we touch and feel are etched onto us, mapping zones and patterns of our experiences, our traumas and losses, our sensuality and feeling. Bringing the biological and the ornamental together to subvert the usual imagery of the female body, Salma uses decorative and ornamental forms, arabesques, whiplash and sinuous lines, and curvilinear shapes in her work, as a language of the biological sensational body, to try and capture the body we feel not the body we think we see. The shape of the bodies of the ‘dolls’ in this series is based on the paisley tear drop shape or Boteh. An ‘Eastern’ ornamental form that has travelled and transformed across time. It has complex origins in many cultures, mainly from Iran, Azerbaijan and India and now has many connotations, of colonial trade, and a feminised and orientalised idea about ornament. Yet it had a previous changing life of meaning across cultures, symbolising or embodying concepts of eternity, life, of humility, of being bent under the weight of conquest, a fruit, a seed, a pine, a flower, a tear, that were not reserved for the feminine only. 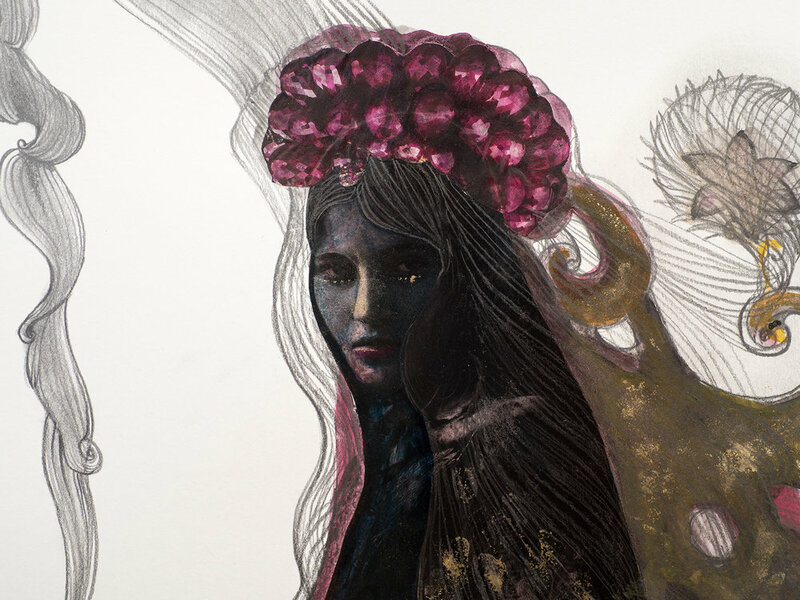 These works on paper have been made using graphite, Indian Ink, collage, watercolour, acrylic and gold pigment.